Scientists have figured out a noninvasive way to screen for diseases that can jump from monkeys to humans. The key ingredients? Rope and a dollop of strawberry jam. Global disease surveillance has been performed for years, but the logistics of screening primates for zoonotic pathogens— diseases that can be passed from animals to humans—have often presented a challenge because invasive sampling techniques, such as collecting blood or using oral swabs, require anesthesia in the field. The new method opens new doors for the study of primates as sources of diseases that could affect humans in remote tropical settings, says Christine Kreuder Johnson, professor and surveillance lead for the PREDICT project and senior author of the study in the journal PLOS Neglected Tropical Diseases. The simple and affordable method involves a six-inch piece of weaved rope made from nylon or cotton that is dipped into an attractant such as strawberry jam. The ropes are tossed near the animals being targeted for sampling, which pick up the ropes, chew on them, and later drop them. Researchers can then collect saliva from the discarded ropes. 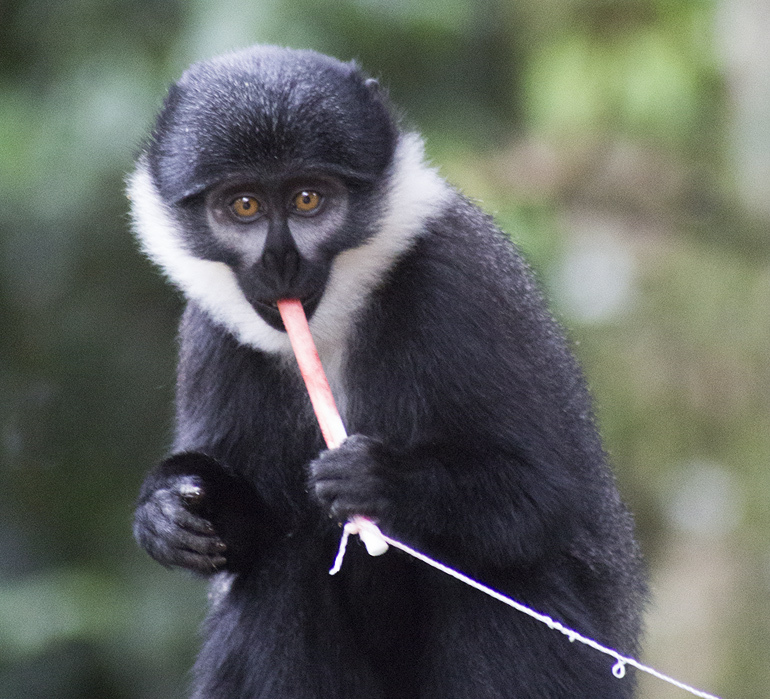 In this study, oral samples were collected from multiple species, including rhesus macaques in Nepal and olive baboons, red-tailed guenons, and L’hoest’s monkeys in Uganda. A variety of viruses, including herpesviruses and simian foamy viruses, were detected in those samples. These kinds of human-animal interactions need monitoring most, the researchers say, because they lend themselves to the spillover of pathogens that can cause a pandemic. Viruses that originate in wild animals account for more than 70 percent of emerging zoonotic diseases in humans, including viruses that have caused pandemics such as HIV/AIDS, epidemics such as Ebola, and smaller outbreaks like Marburg hemorrhagic fever. The USAID Emerging Pandemic Threats Program and a William J. Fulbright Fellowship provided to Smiley Evans funded the work.